Charles Lee Treadway was born on 26 July 1911 at OK. He was the son of George Merian Treadway and Celia J. Reynolds. He died on 21 January 1933 at age 21. [S4531] 1920 Sangamon Co, IL. Census, Chatham Twp. [S4532] 1930 Johnson Co, AR. Census, Pittsburg Twp. Ruby Pearl Treadway was born on 17 February 1913 at Stidham, OK.. She was the daughter of George Merian Treadway and Celia J. Reynolds. Mary M. Treadway was born in 1919 at IL. She was the daughter of George Merian Treadway and Celia J. Reynolds. George Marion Treadway Jr. was born on 24 August 1915 at OK. He was the son of George Merian Treadway and Celia J. Reynolds. He married Orpha Inadell Crutchfield on 14 September 1935 at Johnson Co, AR.. He died on 3 March 1987 at CA. at age 71. [S4533] 1940 Johnson Co, AR. Census, Pittsburg Twp. Minnie Smith was born on 10 February 1899 at TN. She married George Merian Treadway, son of William Lafayette Treadaway and Malinda Edmona Loftis. She died in March 1983 at TN. at age 84. [S1741] Social Security Death Index. [S4711] 1900 Varter Co, TN. Census, Watauga. Earl William Treadway was born on 11 January 1915 at Stidham, McIntosh Co, OK.. He was the son of Charles Henry Treadaway and Mary Elizabeth Ewing. He married Neva Dale on 28 May 1935 at Johnson Co, AR.. He married Gregoria Atencio on 26 December 1946 at Colon, Panama. He died on 7 November 1968 at Penn Valley, CA., at age 53. [S1266] 1930 Maricopa Co, AZ. Census, Higley Precinct. [S4349] 1940 Pinal Co, AZ. Census, Coolidge. [S4709] 1920 Okmulgee Co, OK. Census, Tiger Twp. Clarence E. Treadway was born on 8 October 1912 at OK. He was the son of Charles Henry Treadaway and Mary Elizabeth Ewing. He married Beatrice Mollie Turner on 18 May 1935 at Johnson Co, AR.. He died in June 1975 at Penn Valley, CA., at age 62. Beela Jewel Treadway was born on 24 December 1920 at Henrietta, OK.. She was the daughter of Charles Henry Treadaway and Mary Elizabeth Ewing. She was named "Bella" by her aunt Estella, from a book on Indian "Bellah. 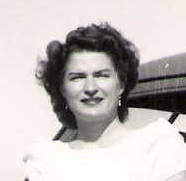 "3 She married Jesse Marvin Vannoy on 31 March 1940 at Coolidge, Pinal Co, AZ.. She lived in 1942 at Florence, Pinal Co, AZ.. She lived in 1947 at Phoenix, AZ..4 She married Douglas Gardner Gilpin. She lived in 1984 at Nevada City, CA..5 She died on 5 January 2006 at Sacramento Co, CA., at age 85. [S4714] Lauraine Vannoy, e-mail to Howard Hickman III, May 2018, photograph. [S30] Interview, Estella May Manlapig, June 1984. [S2937] Phoenix City Directory ,1947, 1951, 1952. [S3109] Letter, Bea Treadway to Marcia Hickman, January 1984. Hazel Loyadale Treadway was born on 11 October 1917 at OK. She was the daughter of Charles Henry Treadaway and Mary Elizabeth Ewing. She married Walter C. Ledbetter. She lived in 1984 at Corvalis, OR..4 She died on 10 August 1992 at Benton Co, OR., at age 74. [S1088] Obituary ,Statesman Journal (Salen, OR.) 12 Aug 1992. Martha Mozelle Treadway was born on 13 April 1923 at OK. She was the daughter of Charles Henry Treadaway and Mary Elizabeth Ewing. She married Walker Wallace Hanson on 16 April 1941 at Coolidge, Pinal Co, AZ.. She died on 11 March 1996 at Sacramento, CA., at age 72. Mary Elizabeth Ewing was born in 1883 at OK. She married Charles Henry Treadaway, son of William Lafayette Treadaway and Malinda Edmona Loftis, on 19 August 1911 at Eufala, McIntosh Co, OK..4 She died in November 1968 at Penn Valley, CA..
[S1932] McIntosh Co, OK. Marriage Record ,Book 2, p. 438. James Leonard McCain was born on 3 August 1917 at OK. He was the son of Samuel Arthur McCain and Emily Christean Treadway. He lived in 1977 at Richmond, CA.. He died on 8 May 1990 at age 72. He was buried at Missionary Ridge Cemetery, Mesquite, Dona Ana Co, NM..
[S1998] 1920 McIntosh Co, OK. Census, Simpson Twp. [S1266] 1930 Maricopa Co, AZ. Census, Chandler. Opal L. McCain was born in 1915 at OK. She was the daughter of Samuel Arthur McCain and Emily Christean Treadway. 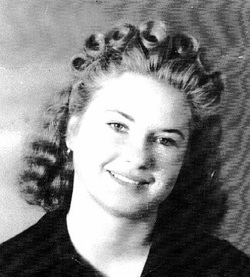 Helen Nadine McCain was born on 24 April 1930 at Chandler, AZ.. She was the daughter of Samuel Arthur McCain and Emily Christean Treadway. She lived in 1977 at El Paso, TX.. She died in March 1996 at age 65. [S4057] 1940 Dona Ana Co, NM. Census. Juanita McCain was born in 1923 at OK. She was the daughter of Samuel Arthur McCain and Emily Christean Treadway. She died in 1971. She was buried at Missionary Ridge Cemetery, Mesquite, Dona Ana Co, NM..
Clara Gwendolyn McCain was born on 17 December 1925 at OK. She was the daughter of Samuel Arthur McCain and Emily Christean Treadway. She lived in 1977 at El Paso, TX.. She died on 18 January 1997 at age 71. Samuel Arthur McCain was born on 18 June 1888 at Atkins, AR.. He married Emily Christean Treadway, daughter of William Lafayette Treadaway and Malinda Edmona Loftis, on 15 October 1911 at OK.5 He died in 1953. He was buried at Missionary Ridge Cemetery, Mesquite, Dona Ana Co, NM..
[S1932] McIntosh Co, OK. Marriage Record ,Book 2, p. 495.